Peter Martin: What's the damage? We mortgage holders are about as well off as we have ever been. 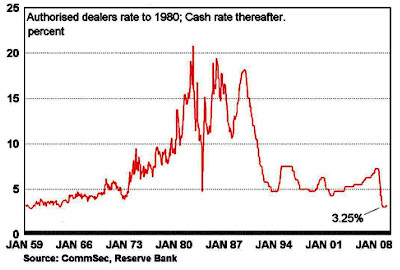 By the way, when did the cash rate peak? Which Johnny was Treasurer at the time? "Well you can’t fault the action, I’ve been arguing for it since the beginning of the year. So as far as I’m concerned today’s action (and ensuing ones) will do much to ensure we achieve a durable, lengthy expansion. You can however fault the RBA for the way they communicated today’s change to the market. There was plenty of scope through official means, for the RBA to flag today’s result rather than through a select number of journo’s the day before – as I mentioned this morning, it’s completely inappropriate. Anyway that being our unfortunate reality…it’s a bit earlier than otherwise thought, but only because the RBA publicly said they wanted time to assess things. The economic case to tighten had been made some time ago and we were really just playing a game of tiddlywinks in guessing the exact month. Yet the RBA had previously expressed some concern about the strength or rather sustainability of the recovery in 2H09. That being the case, I don’t think this early action is immaterial. In fact I think today was an important signal – but maybe to be sure well have to wait for another leak! The fact they hiked today suggests they are a little more anxious to get rates to a less, exceptionally stimulatory setting. Note that during the last tightening cycle the majority of moves were tied into inflation results – the RBA highlighted that just recently. So they didn’t wait for that this time and they didn’t really wait for proof the economy, or specifically the consumer, was able to stand in the absence of cash hand outs. I’m not saying they should have – but it’s what they indicated to the rest of us - on the outside – that they would do. House price growth and housing credit seem to be the main concern here. Their global and domestic economic assessment was more upbeat but only a little different to last month’s – excepting the hike. Globally growth was still described as “resuming”; China being very strong, but the Bank was perhaps a little more specific on growth for Australia’s major trading partners - arguing theywould be close to trend in 2010 (a new assessment from last month). Less was said on the major downside risk noted in September – in that balance sheets “remain a potential constraint on…expansion” for the relevant nations - a bit of a downgrade from last month. On the domestic side their language was a touch more optimistic. The stand out being a new paragraph on housing credit growth and house prices “rising appreciably” – that’s why I think this was the tipping point for them. Watch this space. The faster they accelerate then the more aggressive the RBA is likely to be. Otherwise nothing else really stands out as being too different from last month - maybe just their expectation for trend growth in Australia next year – does trend growth imply a trend cash rate? So in my mind that leaves another 25bp hike in November following the Q3 CPI as a good bet, for an end year cash rate of 3.5% compared to my 3.25% forecast earlier. A further 25bp in December is possible if the data comes in on the stronger side – specifically inflation, housing credit and price data. 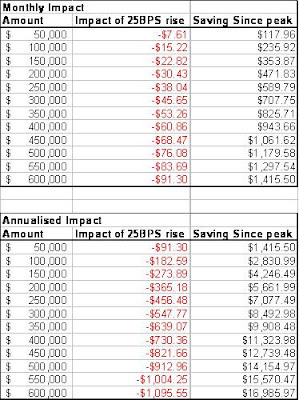 For my money I don’t think 50bp hikes are an option for the Bank just yet. That may come next year, but to do so now would send the wrong message to the market and risk destabilising the recovery. So I think we’ll see 25bp moves at a time and not necessarily in every month. Interesting times - but certainly still every reason to party like its 1999 2003. The cash rate is still extremely stimulatory and mortgage rates low. Fact is rates globally are going to be very low for a very long time - or so they keep telling us.